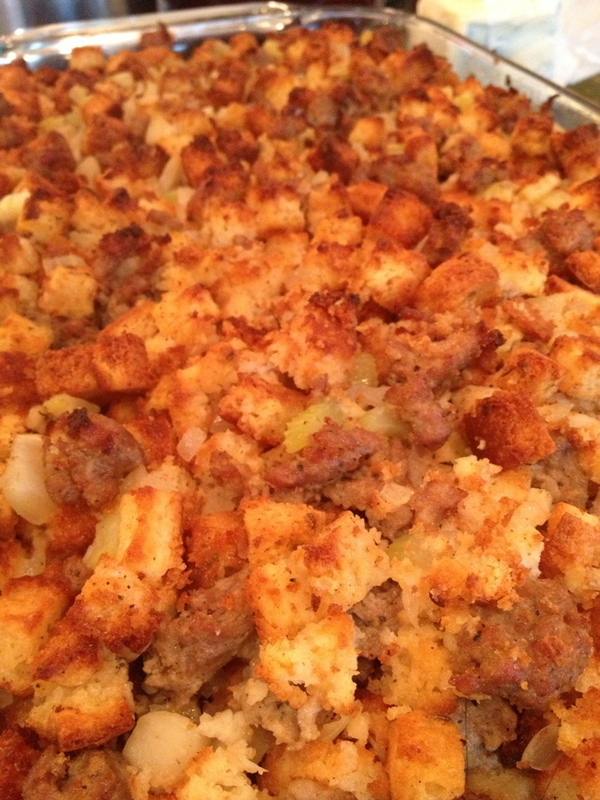 This was the stuffing recipe handed down to me from my mother, who has since passed away. For many years, I stuffed the turkey with the very same version, only it was normal bread croutons, Pepperidge Farms Herbed Dressing to be exact. extra melted butter for basting, and extra stock for adding moisture if needed. Heat oven to 250 degrees. 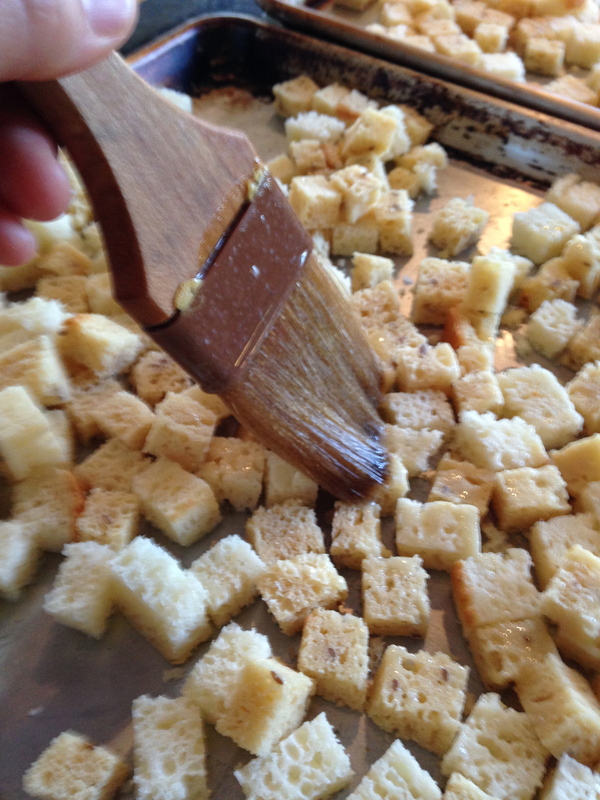 Lay the bread cubes out on sheet pans and gently brush with 1/3-1/2cup of the melted butter. and bake until the cubes are dried out and crisp. Stir a couple of times, so that all sides are exposed to the heat. This may take between 20-40 minutes, depending upon the moistness of your bread. (I have done this up to a week in advance, freezing them in a ziploc freezer bag and defrosting on a sheet pan when needed.) Let cool. 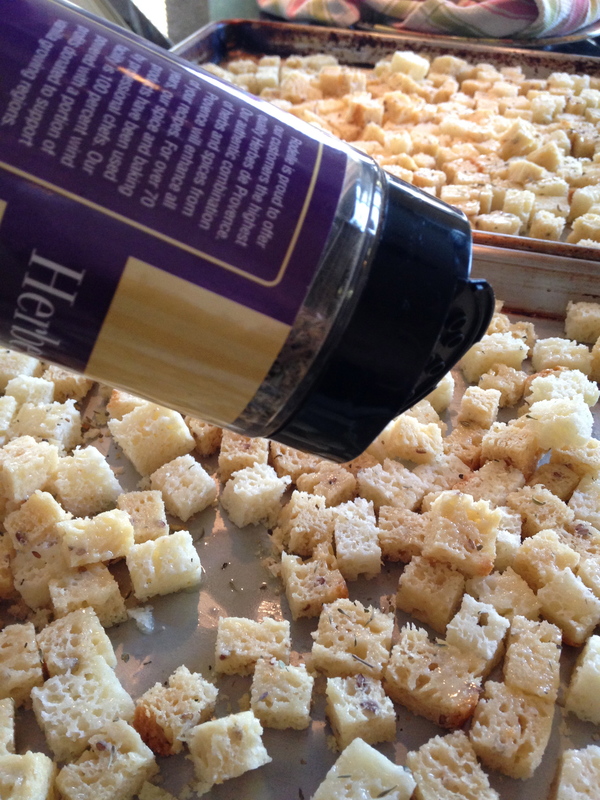 When ready to bake, toss the warm sausage mixture with the bread cubes and sage, gently, until evenly combined. Add the turkey stock until the mixture looks moist, but not wet. This is going to take some eyeballing, just remember, you can always add more stock for moisture. You most definitely do not want a soggy mess, err on the side of caution. Start with 1 cup of stock, adding 1/2 cup increments until it absorbs some of the liquid, but are still fully intact. 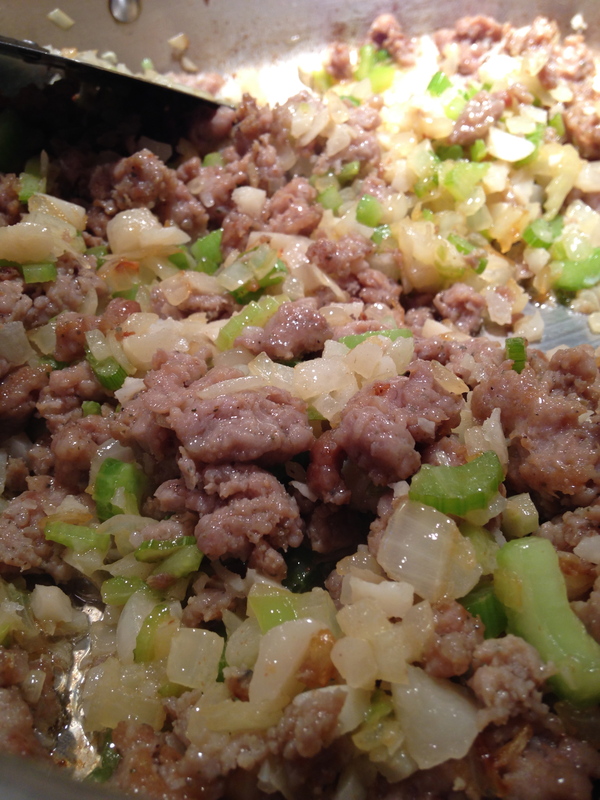 Pour this mixture into your casserole dish or desired baking pan and bake at 350 degrees for 30-40 minutes. The first photo is a 9×13 pyrex dish, but I doubled the recipe for this. Baste frequently with additional melted butter, and stock if needed. Your goal here is for the top to become buttery/crunchy/golden and the underneath to be moist, tender and yet still fluffy. You can check the progress with a fork, gently lifting the top layer to get a gauge on how the bottom layer is doing. When the underneath steams and the top is browned, it’s done. If you are looking for a traditional tasting stuffing that is sure to please even the pickiest of eaters, you can’t go wrong with this one. If you try it this year, or at any time, let me know what you think! – I wrote this recipe in this format, so that it feels like I am in the kitchen with you, walking you through the steps. – It sounds vastly more complicated than it actually is. – This recipe is also very flexible: If you hate sage, omit sage. If you want to trim some of the fat, cut the butter by half and drain the sausage. We don’t, because I eat this once a year and we like it just exactly this way, plus I limit how much I take. Portion control! – You can up the ingredients to suit your taste. I believe in the photo, I used a pound and a half of sausage. What can I say? Pork and pork fat rules. 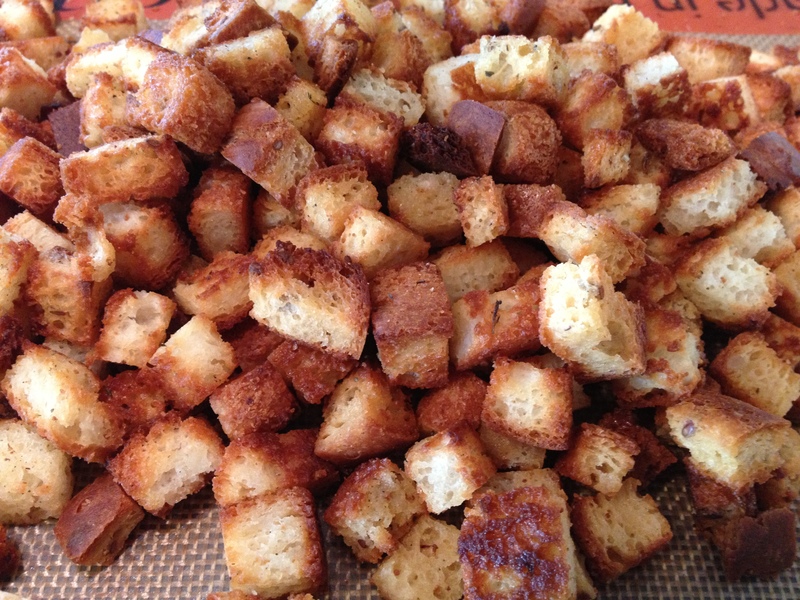 – You can make this dressing with regular old bread cubes from the bag (which I did for decades) using the liquid portions listed on the package. – For leftovers we always, and I mean ALWAYS have a turkey sandwich on white ‘bread’ with thick slices of turkey, mayo, cranberry sauce and stuffing. It honestly makes for the BEST sandwich ever, and as I said above, it’s a sandwich I eat once a year, so I allow myself the indulgence. – I apologize for the anemically yellow photo of the finished dish. One of my goals this Thanksgiving is to pick my brothers brain on ways to achieve better pictures. He is a photographer, and obviously I am not. My trusty iPhone has served me well on my Facebook cooking page, but it’s time to step up my game! This afternoon the last remnants of Christmas were boxed up and put away. I love setting up the tree every year and enjoying the ornaments all season long. Some people like their tree to match their decorations. Some people have concerns about little children, or pets. Some like a live tree, some an artificial. Some are attracted to tall spindly trees, some like them squat and fat. I enjoy them all, since each tree reflects the personality and character of both the individual, family and business. In our home, we have a ‘family’ tree. (see Christmas Past) A few ornaments from my childhood, a few from my parents, one or two from a great grandmother, and a myriad collection from every year our my marriage and motherhood. It is part of a tradition I started on the first year of our marriage, an ornament to reflect the passing year. One year we took the family on a Disney Cruise (highly recommended), so the ornament was a medallion from the ship. One year was a gold 3D City of Portland cityscape, in remembrance of my hometown which we had moved from that year. One of my favorites is the Christopher Radko ‘baby’ I found with my mother (top center) when were celebrating the birth of my oldest. One year, we had a giant ornament making part for my daughters and their friends. (the ’09 cinnamon ornament you see) A more recent collection included a clay miniature Army hat for my college freshman who had enrolled in ROTC, an angel for my youngest ‘angel’, a mini cigar box for hubby and a roll of sushi for me. This year, to honor our trip to the Hawaiian Islands, you see the snorkel gear and fins in the foreground. Grandpa Bill adds to the collection, sending an ornament to the girls every single year. And every year, I pack away the ornaments for the girls to a special box designated ‘Girls Ornaments’. That way, when my daughters finally fledge the nest, they will have a Tree of Memories all their own. This is just one of our family traditions. What traditions do you have? Ones that you will pass on to your kids? Try to find ones that last beyond the moment, ones that are part of an annual event. Ones that will hopefully cause your own children, and grandchildren, to pause and think about family and the memories you have created along the road of life.